Passover is now over, but not before I made my favorite holiday breakfast, Matzah Brei (rhymes with “hi”). Almost every year, I make sure to buy some matzah, sometimes after the holiday, just for this recipe. I couldn’t find my own recipe written down anywhere, so I looked online to see how many eggs to use. The first four recipes I found made it scrambled. My grandmother did that, but not my mom. I winged it on the egg count and it came out great. First, break up the matzah into small pieces. 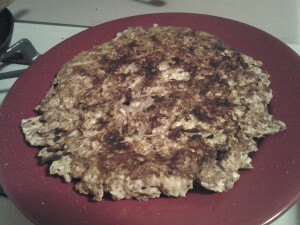 Then add the eggs and milk and stir until the matzah is coated or glazed in liquid. Add some sugar and salt. Fry. Flip. All done. I said it was easy. This year, I used chocolate milk because it’s what I had. I also added cinnamon. Treat this like a pancake, which it is if you make it my way. You can add fruit to the mix, or add fruit as the topping. I like it warm with sugar. As it cools, to room temperature or chilled, it is also great plain. When flipping, my mom has a designated matzah brei plate that she always used. I find it easier to just flip it in the air, like I learned to do with an omelette years ago. My pan is 9.5″ but you can use smaller or bigger. You can also add more matzah for a bigger pan or use less for a smaller. The more full the pan, the neater your edges will probably turn out, as you tuck them into the sides of the pan. Mine were a little messy this year. 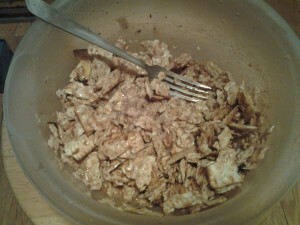 Break matzah into small pieces in a bowl. 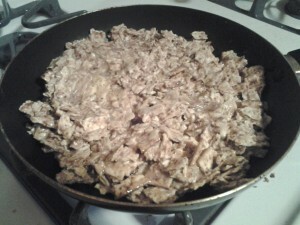 Add eggs and milk and stir until matzah pieces are coated or glazed in liquid. Sprinkle in sugar and salt. Add other flavorings if wanted, like cinnamon. Pour mixture into non-stick frying pan. Use cooking spray to help. Let it cook for a few minutes, until the pancake slides around in the pan freely. Flip over and cook other side, until it slides freely. Serve and enjoy, or chill and enjoy later. Here is another approach. My mom always made full pieces of matzo. Quickly into pan of hot water to soften slightly and into pan of beaten eggs and into the frying pan. BUT the most important part is that half the family liked it nicely crisped and the other half liked them light. We each got the way we liked it. It was many years before we found out…. by accident…. that she fried one side one way… and the second the other way ….. and we each got the plate with our side up. She was a very smart lady. I make it broken up and then fry like an omlet flipped. Sounds like you had Matzah French toast. Clever to cook the two sides differently.